I had to share this tweet from Agent Sarah. 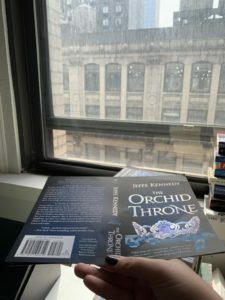 We got the cover flats for THE ORCHID THRONE (out in September 2019, but review copies are going out now – eep!) and they have foil! That’s the shiny stuff on the cover. It shows best in the video from her tweet, but here’s a still pic, in case the video doesn’t play. Super cool, huh? It’s my first cover with foil, and it’s SO PRETTY! Our topic at the SFF Seven this week is Knife in the Heart: The Harshest, Meanest Rejections from a Publisher/Editor/Agent. Come on over to hear about mine.